"The New French Extremity movement has shown what the French are afraid of, themselves." It can be said for any culture, community, collective, that art and the creator's existence or personal convictions are inextricably linked. As horror is deeply personal for many of its consumers, I am aware of its lifelong importance for myself as someone who struggles and pushes my own boundaries of perceived comfort. To face fear, address it, obsess over it, understand it, and possibly even neutralize its potency. As an accessible "global village" has exploded in the past 16 years, there's a quicker return on the films we get to see from across oceans. Especially for genre fans, the newer films from spaces all throughout Europe show shared fears that are uniquely rooted in each country and yet translate well to, in my case as a United States citizen, my own radically vast national culture. In regards to France, the genre community occupation has leaned much on titles like High Tension (2003), Martyrs (2008), and Inside (2007) to coin a movement we know as the New French Extremity. 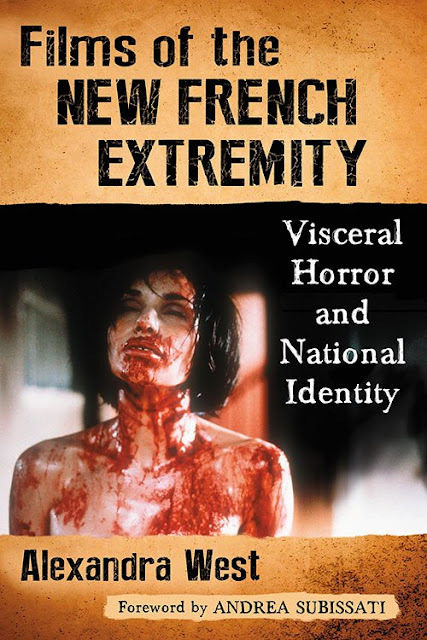 Journalist and scholar Alexandra West beautifully entangles socio- cultural and political history in her latest work, Films of the New French Extremity: Visceral Horror and National Identity. Think of this body of films as a complicated, brutal yet beautiful unmasking of France's amnesia and ideological preoccupation with modernity. What Films of the New French Extremity accomplishes as an objective is giving readers a directive, noting that the films West covers "have deep ties to France's land and history." The strength of Films of the New French Extremity rely on crafting context. A meticulous overview of France's tumultuous philosophical and war-fueled history as well as French art and film techniques are added to benefit this sub-genre's importance in film history. Its comprehensive accessibility that invites you in with a depth of knowledge and various discourses that surround each film West covers will enhance first-time viewing experiences and enrich sophomore returns. One clever twist in West's prose surrounds France's culture of historical dismissal and how New French Extremity films consistently contest it. An example of the country's inescapable past plagued by violence was its governed collusion with the Nazi's during World War 2. That fact has left France battling with a conflicted identity. The France or Paris and beach side residencies we're told the wealthy and celebrities vacation on is presented as an oasis of opulence, serenity, and love. But France suffers from terrorism, riots, as well as large scale racial and religious discrimination that feel unsurprisingly familiar, removing the veil of its ideal allure. Similar to what American genre filmmakers accomplished beginning in the early 1970's, West notes, "the auteurs of New French Extremity may not offer solutions for which the masses have clamored, but they offer a vision of France, one that has not forgotten its history but confronts it." From a critique of heterosexual coupling-as-security in In My Skin (2002) to "the anti-humanistic side of religion" in Martyrs, directors Marina De Van and Pascal Laugier shake nations out of any France they could conceive, and demonstrate West's sentiments in ways that make this literary piece flow with (un)ease. Although these New French Extremity films are weighty and emotionally exhausting, they're compelling and relentless within our consciousness. In Films of the New French Extremity, West doesn't strip these films of their raw nature but interestingly, offers a peace with our own relationships to them. What makes Alex's perspectives on film so unique is that her arguments are not only articulate and insightful, they're deeply personal. Horror speaks to her directly and she has the gumption as well as the literary chops to look beyond the technical and superficial to the cultural implications of these films and the cinematic movement they comprised. To consume Films of the New French Extremity is to immerse yourself in a France West forces us to face with the New French Extremity movement as a guide. Whether you like these films are not, West does an excellent job of compelling readers to urgently seek them out or re-watch. I have to admit, I'm smitten by our analogous approach to scholarship on film and she made a topic I knew little about, a pleasant read and easy to recommend. See An Advanced Screening Of Pet Sematary In Philly! Is Respectability Politics Killing Black Horror?